In the office setting, people come and go. Some stay for a short amount of time, while some stay longer than they expected themselves to be. There are several reasons as to why people leave. However, it is a must for the colleagues to gather up one last time and say their final goodbyes. Though it is a difficult step, you must bear the heavy feeling of having to part ways with someone you shared so many memories with. You may also see business lunch invitation templates. A farewell lunch invitation is used to share one last lunch before the person leaves the office. It will be a long time before you see that person again. The invitation gathers up the closest people to the person. The lunch is a time where memories will be talked about and well wishes for the future are said. 1. Look for a template. 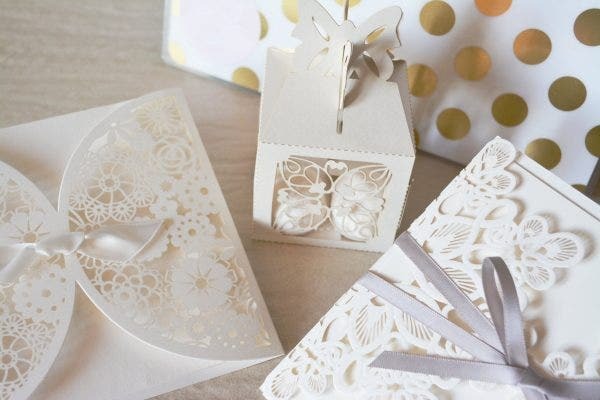 Online templates for an invitation of any kind are readily available at various prices. Choose a template that fits your budget and your taste. Take note if the colors are too bright or too dark for an invitation. Look at the size and decide if it’s too big or small for you. You also have to take note if the template is compatible with your photo editing applications. Once you find a template, purchase and download it right on your computer. 2. Put the basic information. Put the name of the person leaving the office, time and date of the lunch, and the venue. These are pretty important parts of any invitation in any event. 3. Use an attractive font. More than the basic information and the design of the template, the font to be used plays a huge role in the overall design of the invitation. 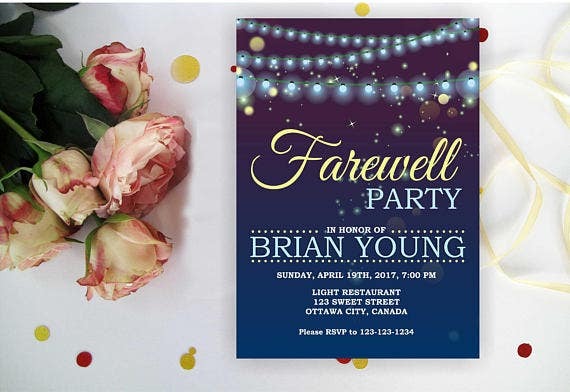 Pick an attractive and clean font to match with the template of the invitation. 4. Put in the right words. There are usually words written to cordially invite people to the lunch event. Some are words of well wishes and honoring the leaving person, while some words are used humorously to depict a new journey in life. Humor is something that can be applied when the leaving person is a soon-to-be parent. You may also see team lunch invitations. Make some changes in the template such as the color and the minimal aspects of the design. Most of the online templates on the internet can be customized in any way once purchased. Make the template as your own and do as you please. You may also see farewell lunch invitations. It is a very basic and unspoken rule in digital design. Believe us when we say that it saves you from the hassle and unnecessary restarts. You may also see holiday lunch invitations. The farewell lunch wraps up the last lunch of the person leaving the office. He has a lot of reasons for leaving the job. Some of them are good and some are bad. Whatever the reason is, an employee will leave the workplace if he needs to. You may also see farewell lunch invitation designs. The employee can come across a new job opening that’s been his lifelong dream. As someone who looks for better opportunities other than the job he has now, it is his chance to grab it and leave the rest behind. Opportunities are just around the corner, but the good ones knock only once. Never let a good opportunity slip by when you have lots of chances to get it in the first place. It will be a waste of time and talent to remain in one place that does not get you anywhere. 2. Starting a new chapter in life. Starting a new chapter in life does not require any age. You might get married in your early 20s and be a devoted partner all your life, or you have to quit work to enroll in a Master’s degree program. In life, we are meant to move to places and meet new people. Sometimes, we have to start over and leave the rest behind. Parenthood is also a good chapter and reason why people leave their jobs. They have to look after their kids and see them grow under their care. The new chapter will always be something better than what employees have now. You may also see formal lunch invitation template. Every family undergoes hardships and struggles to get through it. When an employee is stuck in a family situation that he can’t say no to, he has no choice but to leave the workplace. For example, when a family member is sick and the employee’s family don’t want to hire a nurse to look after the sick one, the employee takes on the role. The other members of the family provide financial support for the daily expenses to be covered. A whole lot of family situations exist that needs the full attention of the employee should be considered. You may also see free email lunch invitation template. Employees would always look for a job that gives them a higher salary. With the high prices of today’s living conditions, a basic salary won’t be able to cover the daily and monthly expenses. Employees would find a financially stable company that can pay them well according to their skills and experience. 5. Seeking more challenging work. Some employees are bored with the jobs they have. It is either not challenging them to do better or it is simply following routines to the point of boredom and lack of drive to work harder. They end up seeking for another job that maximizes their skills. Leaving their current workplace is not an issue if it is a matter of motivation. You may also see free office lunch invitation template. 6. Expand and enhance skills and abilities. Jumping out of the current work and making your way to another company is a good opportunity to put skills to good use. Some employees feel that their skills have been underused while working in their present job. Finding a job that caters to their set of skills will make them work harder. You may also see free simple lunch invitation template. 7. Being underestimated and undervalued. When an employee feels that his contribution to the company is not valued in any way, he would begin looking for another job that might give him that kind of feeling. An employee should feel that his effort is being valued and he is a part of a much larger picture that goes beyond his job description. Aside from what he does, his worth as a person should be of value to the employers who hired him into working for them. Aside from the situations, the people in the workplace can make an employee leave. The boss can be pretty demanding and strict, and the office mates are always gossiping about the employee. This makes him feel isolated and alienated from the people around him. It also has something to do with the office culture and hierarchy. Strained relationships with colleagues can take a toll on a person in a workplace setting. Some go beyond the borders of professionalism and do impulsive acts out of personal motives. You may also see team lunch invitation template. Corporate culture can be seen in so many aspects. It is about the proper treatment of the employee and giving them the right compensation and benefits. It should celebrate the success of the company and dedicate it to the employees. The company holds events for this. The corporate culture matters on how hard the employees work. It should create a warm and friendly environment for each and everyone. 10. The company’s financial stability. The financial stability of a company is a big factor for the employee’s departure. The employee is likely to leave when the company suffers from financial difficulties that have multiple effects, such as big losses in profit and reduced working hours. Employees tend to worry so much about it that they choose to leave before it all goes down. You may also see printable dinner invitation templates. Loss of motivation is attributed to the factors mentioned beforehand. It can be because the employee feels stagnant in his job, the people around him don’t have anything better to do, or everything is just plain boring. It’s hard to bring back a lost motivation, especially when it is something the employee needs to get himself to work every single day. You may also see dinner invitation templates. When something important and urgent is happening in the office, everyone is informed right away. Employees should be informed since they are the ones doing most of the work. If there are any problems regarding their work, they should be told so appropriate solution can be provided. Without proper communication, employees get frustrated. This makes them feel less valued and important, thus coming up with the decision to leave the job. You may also see potluck invitations. When a person leaves in goodwill, we should always wish him the best of everything. Life is not meant to be lived by staying in a single place. More opportunities and chances wait for you as you go outside of your safe zone. You may also see formal invitation templates.